Buy the CD and get a FREE copy of the cassette! 5 of 5 Stars! "This is my new favorite CD. I'm now a huge Jo Morrison fan, thanks to this CD and other CDs' and books of hers I've bought recently. She has great style that seems to me to be JUST RIGHT. I attempt to emulate her style in my playing. Maybe someday! Her "Rights of Man" and "Choirsdains' Lullaby" are particular favorites. I don't think anyone would be disappointed in a purchase of any of Ms. Morrison's work." 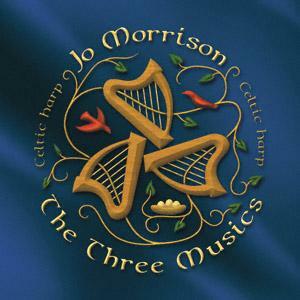 The Three Musics is mostly traditional music from Scotland, Ireland, and the Shetlands Islands, but Jo has written several tunes for it as well. The tunes are included on this album. Several complete tunes are available. These files are big, so don't expect fast downloads. Send e-mail for locations outside the USA, or for other domestic US mail options. It is also available at the Carroll County Arts Council Gallery in Westminster, Maryland. Note: Due to software limitations, the normal multiple-item shipping discounts are not available at the exact price quoted here for PayPal purchases. Checks or money orders must be used to take advantage of the exact discounts, or email your order to me directly and after receiving a quote from me follow the directions to send PayPal payment to Jo at harp@celtic-harp.com. Sorry for the inconvenience! The Three Musics was recorded at Bias Recording, Springfield, Virginia. The album was produced by Heidi Gerber and Jo Morrison, engineered by Heidi Gerber. Mastering was by Charlie Pilzer and David Glasser of Airshow Mastering. Artwork and packaging for The Three Musics and my triharpskele logo by Amanda Fisher, Pixelations, Inc. The album cover is Copyright © 1998 Jo Morrison, All rights reserved. The triharpskele logo is Copyright © 1998 Amanda Fisher and Jo Morrison, All rights reserved. Neither the album cover nor the triharpskele logo may be used without permission. This web page is Copyright © 2010 and all sound clips are Copyright ©2002 by Jo Morrison. All rights reserved.